J.B. Moore, who owned the trading post at Crystal, New Mexico from 1897-1911, was another visionary trader who exercised enormous influence over early Navajo rug design. Perhaps his most important innovation was to introduce weavers in his region to Oriental rug patterns. Motifs probably derived from oriental rugs include repeated hook shapes (often called latch hooks), the waterbug shaped like an X with a bar through the middle and, in a small number of weavings, rosettes. An even more lasting and fundamental influence was the concept of a large central motif in one, two or three parts, that covers almost all of the ground between the borders. Even the concept of the border itself, usually in two or three layers with at least one in a geometric pattern, is probably traceable to oriental carpet design. 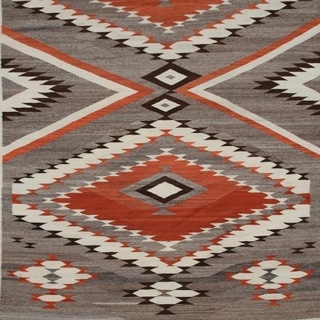 Though introduced in the region around Crystal, these motifs and ideas quickly spread to other areas of the Reservation and are found on many rugs woven throughout the past century. One of the most popular patterns that likely resulted from Moores work at Crystal was the Storm Pattern. This design is generally defined as a central rectangle connected by zig-zag lines to smaller rectangles in each corner. The storm pattern often is said to have symbolic meaning: the zig-zags are lightning, the corner rectangles are the four sacred mountains of the Navajo or the four directions or the four winds, etc. The storm patterns precise origin is uncertain one story suggests it was developed by a trader on the western side of the Reservation but the weavers at Crystal developed this concept into one of the most popular and lasting of all Navajo rug patterns. Large Navajo Crystal Storm Pattern Rug, c. 1980-90, 121" x 66"
Navajo Crystal "CUBA N.M" Rug c. 1920s, 64" x 40"
Navajo Crystal Double Saddle Blanket with Valero Stars, c. 1900, 60" x 34"
Navajo Crystal Rug c. 1910s, 56.5" x 36"
Navajo Crystal Rug c. 1910s, 65.25" x 39"
Navajo Crystal Rug c. 1910s, 66" x 38.5"
Navajo Crystal Rug c. 1960-70s, 38" x 28.25"
Navajo Crystal Rug with Arrows and Crosses, c. 1910, 65" x 38"
Navajo Crystal Rug with J. B. Moore Influenced Border, c. 1910, 74" x 37"
Navajo Crystal Rug with Storm Pattern c. 1980s, 60" x 34.5"
Navajo Crystal Rug with Stylized Yeibeichei, c. 1900s, 72" x 48"
Navajo Crystal Rug with Whirling Log Design, c. 1915, 65.5" x 41"
Navajo Crystal Rug, c. 1900-10, 88" x 56"
Navajo Crystal Rug, c. 1910, 66.5" x 36.5"
Navajo Crystal Rug, c. 1910, 77" x 44"
Navajo Crystal Rug, c. 1910-15, 95" x 49"
Navajo Crystal Rug, c. 1920, 93" x 58"
Navajo Crystal Rug, c. 1930, 45" x 24"
Navajo Crystal Rug, c. 1930, 53" x 32"
Navajo Crystal Rug, c. 1930, 72" x 39"
Navajo Crystal Rug, c. 1930-40, 77.5" x 58"
Navajo Crystal Rug, c. 1950, 153" x 87.5"
Navajo Crystal Rug, c. 1950, 66" x 50"
Navajo Crystal Rug, c. 1950-60, 59" x 44"
Navajo Crystal Rug, c. 1960, 100.75" x 60.5"
Navajo Crystal Rug, c. 1990, 73" x 46"
Navajo Crystal Sampler c. 1910s, 17" x 18"
Navajo Crystal Storm Pattern Rug c. 1900s, 53.5" x 36"
Navajo Crystal Storm Pattern Rug c. 1980, 53.5" x 39"
Navajo Crystal Storm Pattern Rug c. 1980, 61.5" x 32"
Navajo Crystal Storm Pattern Rug with Valero Stars, c. 1930, 121" x 74.5"
Navajo Crystal Storm Pattern Rug with Whirling Logs and Waterbug Designs c. 1960, 90.5" x 64.5"
Navajo Crystal Storm Pattern Rug, c. 1920s, 69" x 47"